“Health insurers will rapidly move from passive payers to active players” – this is the key finding of a Masterclass on disruptive digital business models for health insurers. 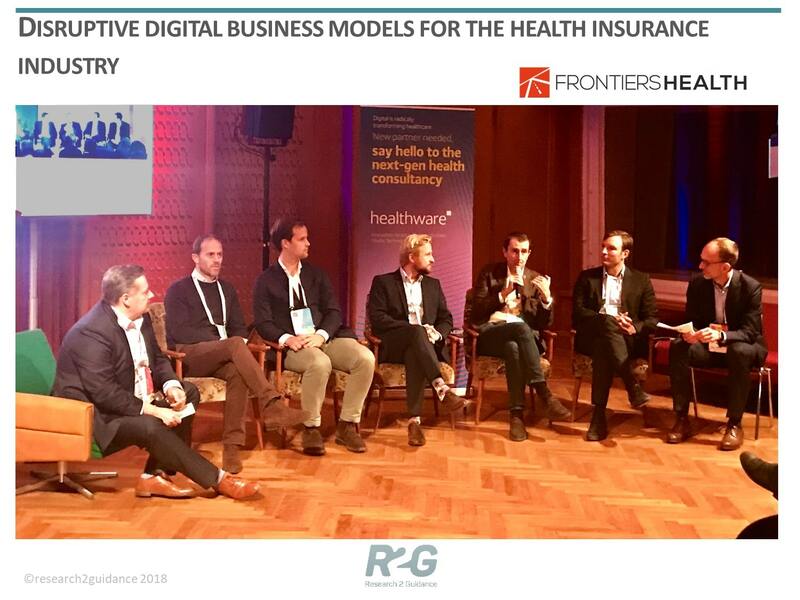 The session which was jointly organized by Reserach2Guidance and Healthware took place during last week’s Frontiers Health Conference in Berlin. It brought together representatives from big payer organizations such as Swiss Re and Allianz, as well as digital health Start-Ups like Kaia Health, Amicomed or hi.health. The transformation of the payer industry is literally at our doorsteps as the results of Research2Guidance’s recently published global study showed. In regions such as North America or Asia, a plethora of new service and business models are already emerging. Many of the newly created business models aim at either acquiring new members or provide better service to existing members via digital platforms or digitally assisted services. Examples are BIMA from Sweden offering microinsurance for emerging markets, Vitality from the UK or Zhong An from China, both offering activity-based freemium health insurance coverage. US-based Oscar Health offers its customers digitally assisted concierge services to better manage them and supply more convenient care and assistance. Other digital business models target specific customer segments such as employers and aim to offer them health insurance platforms from which they can easily select different health plans for their employees and manage them. This is what companies such as bind and Collective Health in the US are doing. Clover Health is also targeting a particular segment, in their case, these are high-risk patients which they manage better using AI-based tools and services. US-based company Patch features yet another new business approach: they are licensing their platform for reimbursement optimization to health care providers who can then instantly tell their patients what the reimbursed amount will be and how they can best submit their claim. These new entrants to the health insurance market could already raise almost 2 billion USD in funding. Europe is not going so fast, nevertheless, some first-movers have already proven a good traction in the market. Especially, the building up of the digital partner ecosystem will be challenging for payer organizations in the light of the multitude of health Apps, solutions and services that are existing. On the other hand, the message to start-ups and innovators was quite clear: they need to make sure that their value-proposition is crystal-clear and comes down to more than “nice-to-have” when we aim for better health management and an increased customer experience and service quality. And it is exactly this – service quality and health management – where the payers see the biggest potential for digital innovation. The digital transformation of the payer industry will mean much more than just adding apps to existing offerings. Also in Europe, payers start to think about moving out of their traditional core business areas and offering new services to new customer segments well beyond their traditional ones. As one industry representative was recently saying: “Digital is finally taking-off – and is gaining speed rapidly”. If you want to learn more and get more examples of insure tech business models, please have a look at our recently published report “The 10 Disruptive Digital Business Models for Health Insurers”. The report details ten most promising digital business models for payer organizations worldwide.